Dong Energy has sunk the first suction bucket jacket into the seabed of the North Sea. The new foundation structure will be tested at the wind farm Borkum Riffgrund 1. The suction bucket jacket consists of a three-legged jacket structure with three cup foundations that are anchored in the seabed using suction. The foundation is installed in a single lifting and assembly process, reducing both the construction time as well as the associated costs. In addition, it is characterised by a quieter installation. This foundation type has been in use for about 20 years in the oil and gas industry. It is now being tested for the first time in the construction of offshore wind farms. "This is a great day for us. 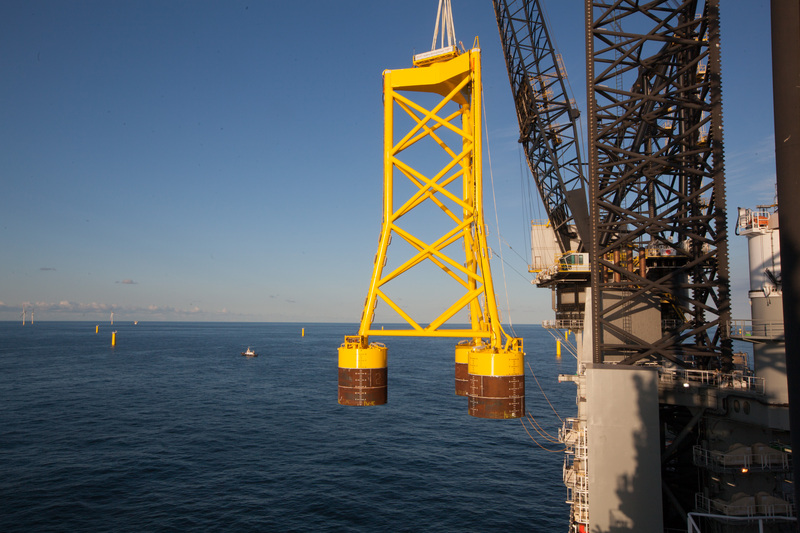 We have installed the first suction bucket jacket in the offshore wind industry. This is a further step towards reducing costs in the construction of offshore wind farms even further," says Tove Feld, Vice President and Head of Engineering at Dong Energy. "The new foundation is also an excellent demonstration of how collaborations in the area of innovation pay off," he adds. Dong was supported in the development of the new foundation by the British Carbon Trust Offshore Wind Accelerator (OWA). With the approval of the German Federal Maritime and Hydrographic Agency (BSH), the prototype can be tested at a German wind farm. This is an advantage, especially with regard to the German noise reduction requirements during foundation installation. "The new foundation type demonstrates that legal requirements promote innovation, and the industry quickly implements these requirements in new developments. This is clearly a pioneering collaboration," said Monika Breuch-Moritz, President of BSH. In October, the installation of a 4 MW wind turbine will follow. The foundation prototype is equipped with a monitoring system to record all data during the construction and operational phases. Together with the Leibniz University of Hanover and the German Federal Institute for Materials Testing, Dong will perform comprehensive tests and measurements on the foundation. The results are important for the future use of this type of foundation and will be included in further approval procedures. The German Federal Environment Ministry is also providing support for the research and tests. The data obtained from the process will be made available to companies involved in the offshore wind industry.